Legends of Tomorrow offered up another wacky mythical villain in “Witch Hunt,” along with an important life lesson for the viewers. This week, Zari (Tala Ashe) and Sara (Caity Lotz) butted heads over how to deal with an anomaly in the Salem Witch Trials while Nate (Nick Zano) and Ava (Jes Macallen) teamed up to wring more money out of the Bureau higher-ups. Neither storyline sounds that dramatic on paper but now that the show has found its comfort zone, it knows how deliver both hijinx and heart tugs in one fell swoop. She’ll sing you to death. 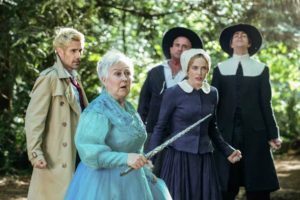 Very few things can top a heart-eating unicorn whose droppings are drugs, but Legends of Tomorrow did its best by producing a malevolent Fairy Godmother who fed off the impotent anger of a young girl in order to rain hellfire on humanity… all while singing her curses to some really catchy tunes. Good thing John Constantine (Matt Ryan) made his belated and begrudging bid to join the team just in time to kick off the fight against her, even if he disappeared for most of the latter half of “Witch Hunt” thanks to a spell that removed his mouth. 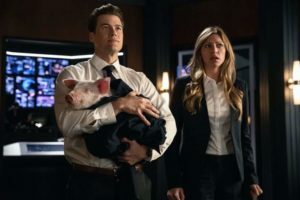 Speaking of disappearances, Ray (Brandon Routh) and Mick (Dominic Purcell) getting turned into swine made for a fun sight gag but also meant that the hour was light on Legends. As long as they get their time to shine later on in the season, though, it shouldn’t be a problem. The most salient part of the Salem storyline was how it set up another impossible choice for Zari, whose family tragedy makes up the emotional anchor of the show at the moment. Once Sara realized that saving Jane Hawthorne from her witchcraft accusation would lead to a massive disruption of the timeline, she was quick to decide against helping her further. While this is a sign of Sara’s growth as a leader, it also tends to hold her back in terms of plot. Nevertheless, Zari takes up the mantle with ease, and Ashe yet again displays her talent for both subtle moments and heart wrenching speeches. She tries everything from blowing off iron bars to using her own brand of magic in a courtroom to save Prudence’s mother since she couldn’t save her own, but it’s to no avail. The realization that men’s hearts haven’t changed, and that the fear of the unknown is as present and dangerous in the future as it is in the past, is brutal but necessary for her development and for the times we are living in today. But thankfully Legends of Tomorrow is still a fantasy, and a tale of hope, so Sara eventually saves the day with a crossbow and a Constantine. Zari is able to convince Prudence to let her rage go by reminding her that even if others men’s hearts remain hardened, that doesn’t mean their hearts have to grow cold too. And as soon as Prudence releases her Fairy Godmother – meaning she can no longer wreak havoc on the village – Constantine is more than happy to give that mythic lady the hellfire she craves by sending her straight to Hell as well. It’s as happy an ending as puritanical times will allow, even if Zari is still no longer to saving her family than she was before. Meanwhile, “Witch Hunt” kills two birds with one stone by pairing Nate and Ava together in a Bureau-heavy plot that turned out to be much more fun than anticipated. After dinner with Dad goes extremely poorly, Nate decides to crash at the Bureau because being a Legend doesn’t actually pay. Ava happens up him and realizes that they could both use some monetary aid, seeing as the Bureau’s budget is far too limited to do the necessary monster-hunting at the moment. With Nate’s bravado and charisma, they should be able to charm the purse strings off any man in charge… Except the man in charge turns out to be Hank Heywood, in a rather surprising twist. First, Gary gets sent in Nate’s stead to present the Bureau’s money troubles, which of course fails spectacularly. But even though the outcome was inevitable, Adam Tsekhman continues to shine in a role that by all accounts should be grating. He infuses Gary with an innocence and charm that makes it impossible not to want more of him – unless you’re Nate’s dad, of course. It is ultimately up to Nate to step up, face his father, and admit that he’s a superhero and his friend Ray has been turned into a pig by an evil Fairy Godmother. The confession turns out rather smoothly, all things considered. So smoothly that apparently Nate’s going to be sticking around 2018 to work for Ava instead of returning to the Waverider for the time being. It makes sense for him to take this opportunity to continue repairing his relationship with his father, but the writing choice makes me wonder how much more time the show plans to spend in the present and what role that’ll play in the overall arc. Though “Witch Hunt” didn’t quite reach the emotional or hilarious highs of last week’s premiere, Legends of Tomorrow delivered another strong episode that made creative use of the season’s premise. It certainly leaves me wondering what they’ve got up their sleeves for the upcoming rock-heavy episode.